RED HEART® Soft™: 2 skeins 4422 Tangerine A, 3 skeins 9939 Jewel Tone B. Two 16” diameter round pillow forms, 1 yard contrasting fabric for both pillows, sewing thread in matching color to fabric, sewing needle, yarn needle. 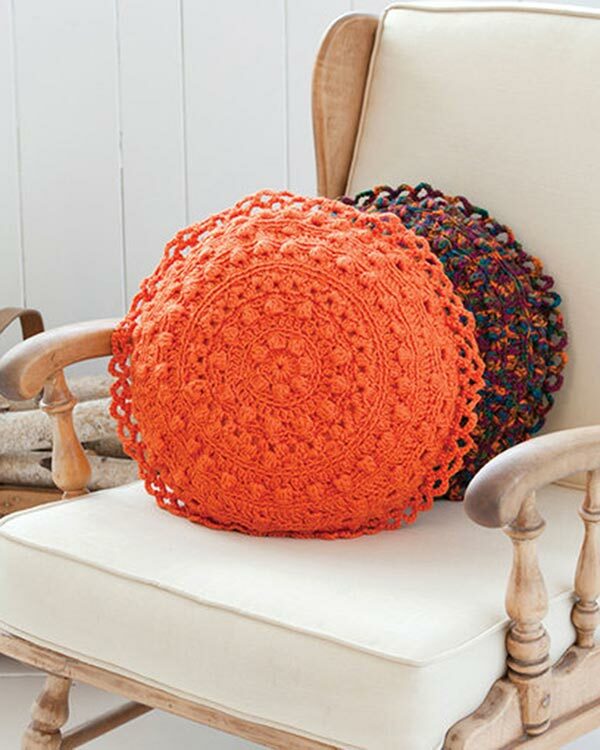 Size: Pillows measure 16” in diameter excluding ruffled edging. GAUGE: Rounds 1-9 = 4” across. CHECK YOUR GAUGE. Use any size hook to obtain the gauge. PS (puff stitch) = [Yo and draw up a loop, yo and draw through 2 loops] 5 times in st or space specified, yo and draw through all 6 loops on hook. Round 1: Ch 6; join with a slip st to form a ring; ch 3 (counts as dc), 14 dc in ring; join with a slip st to top of ch-3 – 15 dc. Work in back loops every round EXCEPT for Rounds 7, 8, 11, and 14. Round 2: Ch 3, PS in next dc, ch 1, 2 sc in next dc, [PS in next dc, ch 1, 2 sc in next dc] 6 times; join with a slip st to top of ch-3 – 29 sts. Round 3: Ch 1, 2 sc in same st as joining, sc in each st and ch around; join to first sc – 30 sc. Round 4: Ch 3, dc in next sc, 2 dc in next sc, [dc in next 2 sc, 2 dc in next sc] 9 times; join – 40 dc. Round 5: Ch 3, PS in next dc, ch 1, 2 sc in each of next 2 dc, [PS in next dc, ch 1, 2 sc in each of next 2 dc] 12 times; join – 79 sts. Round 6: Ch 1, 2 sc in same st as joining, sc in each st and ch around; join – 80 sc. Round 7: Ch 3, 2 dc in same st as joining, skip 2 sc, [3 dc in next sc, skip next 2 sc] 25 times, 3 dc in next sc, skip last sc; join – 81 dc. Round 8: Ch 1, sc in same st as joining, skip next 2 dc, [PS in space between 3-dc-groups, ch 1, sc in next dc, skip next 2 dc] 27 times; join – 82 sts. Round 9: Ch 1, skip first sc, sc in each st and ch around; join – 81 sc. Round 10: Ch 3, dc in next sc, [2 dc in next sc, dc in next 2 sc] 26 times, 2 dc in last sc; join – 108 dc. Round 11: Ch 3, PS in next dc, ch 1, sc in next 2 dc, [PS in next dc, ch 1, sc in next 3 dc] 26 times; join – 135 sts. Round 12: Ch 1, sc in each st and ch around; join – 135 sc. Round 13: Ch 3, dc in each sc around; join – 135 dc. Round 14: Ch 3, PS in next dc, ch 2, [sc in next dc, skip next dc] twice, * PS in next dc, ch 2, [sc in next dc, skip next dc] 3 times; repeat from * 17 more times, PS in next dc, ch 2, sc in next dc, skip next dc; join – 118 sts. Round 15: Ch 1, 2 sc in same st as joining, sc in each st and ch around; join – 119 sc. Round 16: Ch 3, 2 dc in next sc, ch 1, skip next 3 sc, [3 dc in next sc, ch 1, skip next 2 sc] 38 times; join – 156 sts. Round 17: Ch 1, sc in same st as joining and next 2 dc, [PS in next ch-1 space, ch 1, sc in next 3 dc] 38 times, PS in next ch-1 space, ch 1; join in first sc – 195 sts. Round 18: Ch 1, sc in first 3 sc, [sc in PS, skip ch-1, sc in next 3 sc] 38 times, sc in last PS; join – 156 sc. Round 1: Working in back loops, ch 6, skip next 2 sc, sc in next sc, [ch 5, skip next 2 sc, sc in next sc] 50 times, (ch 2, dc) in first ch of ch-6 to join and form last loop – 52 loops. Round 2: [Ch 6, sc in next ch-5 loop] 52 times; join in first ch of ch-6. Fasten off. Cut 4 circles 18” in diameter from fabric. Sew 2 pieces, right sides together with ½” seam allowance, leaving an opening for inserting pillow form. Turn right side out, insert pillow form, and sew opening closed. 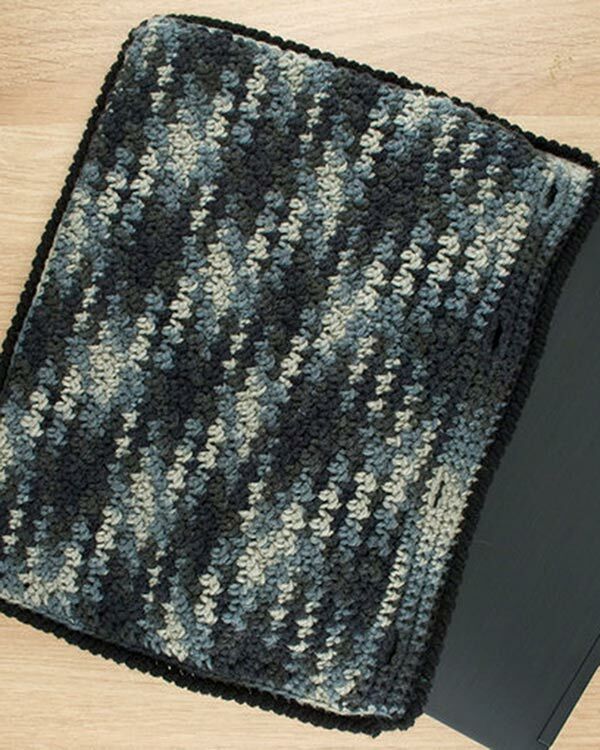 Place pillow between both sides of crocheted pillow pieces with wrong sides facing and line up edges with puff stitch pattern lining up on both sides. Sew pieces together making sure ruffle is left free.